What a view! I'll have to stop by next time I am in town. It is still a grand view! We floated by on the Bateau Mouche, but our feet were already so tired that we didn't stop at L'Institut. Next time. Je ne connais pas le lieu. Une fois j'ai voulu y aller, c'était fermé. Merci pour l'idée que ça me remet en tête. I didn't make it to l'Institut du Monde Arabe during my last visit, and it still remains on my list. This shot is very clever, and it looks like it was a beautiful day. I don't consider myself someone who is afraid of heights, but there is somethings scary about this photo! Have been to the Institut, but never went up to the rooftop. 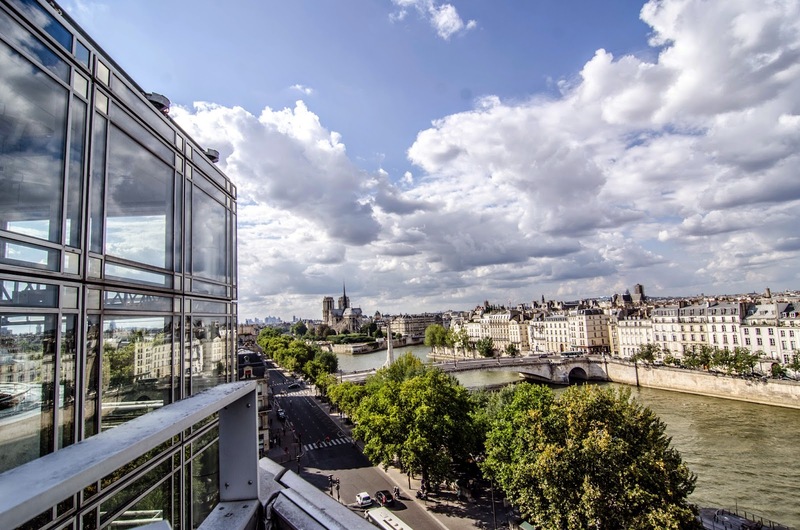 So merci for sharing this excellent view (and some gorgeous clouds too)! A view from Le Zyriab... Your photo and the photo linked to their website are gorgeous ! It is currently not warm enough to fully enjoy the terrace but it is indeed an address to think of whenever you wish to share your table with a nice view in good company. Celebrating something can be an occasion there because it is still not really cheap but, as I have just read : "The more you praise and celebrate your life, the more there is in life to celebrate." —Oprah Winfrey ! Poor Pont des arts !